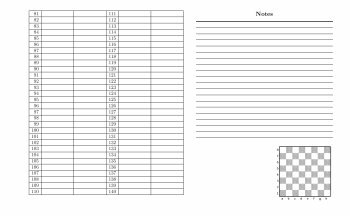 Here is a package of scoresheets for checkers, chess, Go, and Skat, developed with our typsetting system of choice, LaTeX. We think that these are among the best looking and most utilitarian scoresheets available on the web, and of course, they're completely free. Download the complete package here. The package includes the LaTeX source files, pre-made PDF files, and a short description. These are very easy to use, and can be printed on any reasonably up-to-date printer. If you are familiar with LaTeX and LaTeX options and packages, you can customize the forms all you wish. Complete directions for printing and using the forms is provided within the scoresheet package. Comments and suggestions are requested; write bobnewell@bobnewell.net.